A new and significantly revised edition of the popular map, California’s Lost Coast is now available. Featuring black sand beaches, redwood groves, and 60 miles of the state’s wildest coastline, the Lost Coast is a magnificent place to hike. Order the new California’s Lost Coast Map ($9.95) from Wilderness Press for only $7.46 (save 25 percent). The map is also available from Amazon, The Trailmaster Store, and California REI stores. Lost Coast Brewery, located in Eureka, California, is also spreading the word about the Lost Coast to beer-lovers everywhere with its Lost Coast Ale and other award-winning beers. Its beer-making operation has increased dramatically in recent years, and Lost Coast beer is now sold around the state and across the nation, as well as in 11 countries. 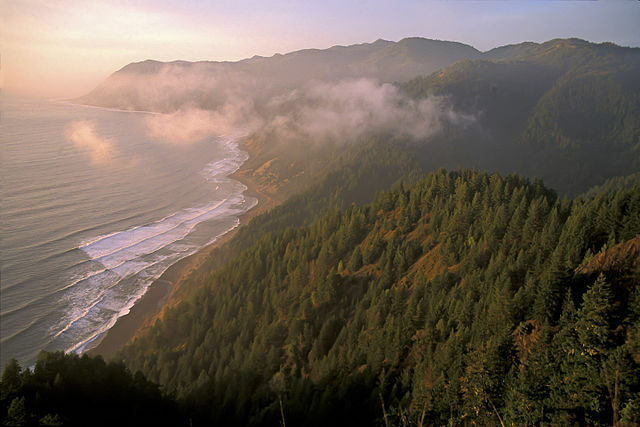 Sinkyone Wilderness State Park, along with the BLM’s King Range National Conservation Area to the north, comprise California’s Lost Coast, located in northern Mendocino and southern Humboldt counties. One reason the coast is “lost” is because no highways cross it. So rugged is this country, highway engineers were forced to route Highway 1 many miles inland from the coast—and the region has remained sparsely settled and unspoiled. It’s magnificent vistas and varied terrain—dense forests, prairies, bluffs and beaches—reward the visitor who plans an adventure on the Lost Coast. The new map incorporates recent changes in facilities and access that add up to altogether better visitor experience. The BLM has upgraded 7 campgrounds and its day-use recreation areas. Trail camps in the King Range and walk-in camps in the state park have also been improved. Roads and trails are in better shape than in years past, with improved signage as well. 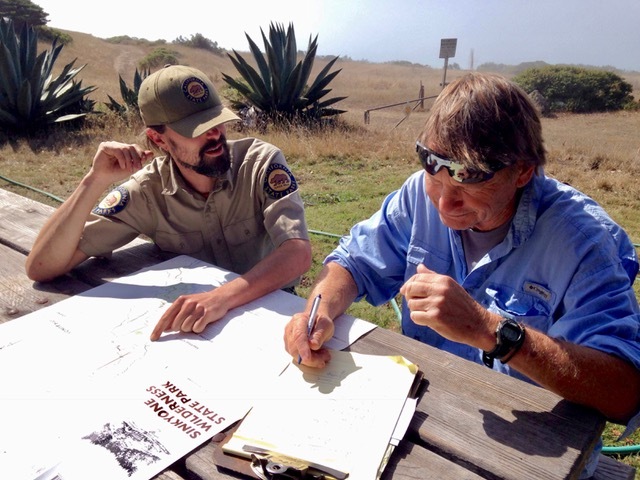 California’s Lost Coast map details the BLM’s new wilderness permit system for backpackers. Those backpackers and day hikers who like to make one-way journeys will be pleased to learn of a new shuttle service that offers drop-off and pickup at all the major Lost Coast trailheads. The map highlights the new Paradise Royale Mountain Bike Trail System, a great way for mountain bikers to experience the Lost Coast. While field-checking his California’s Lost Coast map, Trailmaster John McKinney gets the latest info from a Sinkyone Wilderness State Park ranger. John McKinney, author of 30 books about hiking and longtime coastal trails advocate, created the 1st edition of this map while serving as a volunteer camp host at Sinkyone Wilderness and worked closely with the AdventureKeen team to produce this 3rd edition. John pioneered the California Coastal Trail and wrote a narrative about his adventure: Hiking on the Edge: Dreams, Schemes, and 1600 Miles on the California Coastal Trail.